Blue Dragon and Lost Odyssey developer Mistwalker, Hironobu Sakaguchi's current outfit, is teaming with Majesco and AQ Interactive for Away Shuffle Dungeon, an RPG for the DS slated for a fall release. It casts players as the creatively-named young hero "Sword," who must rescue townsfolk from a "mysterious unknown." Sounds traditional! 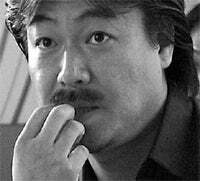 Majesco knows its stuff, commenting that working with Sakaguchi, Sonic character designer Naoto Oshima and Final Fantasy composer Nobuo Uematsu will make the game "well-positioned for success when it hits retail this fall." EDISON, N.J., July 7, 2008 – Majesco Entertainment Company (NASDAQ: COOL), an innovative provider of video games for the mass market, in partnership with leading developers Mistwalker and AQ Interactive, today announced premier RPG AWAY Shuffle Dungeon for Nintendo DS™. Players take control of the young hero "Sword," the sole resident left of the once booming Webb Village, who must rescue as many kidnapped townsfolk as possible from a mysterious unknown that has been slowly "spiriting them away." AWAY Shuffle Dungeon includes creative contributions from renowned industry visionaries: RPG creator Hironobu Sakaguchi, character designer Naoto Oshima and composer Nobuo Uematsu. "We are very excited to be working with the collective creative talent of Hironobu Sakaguchi, Naoto Oshima and Nobuo Uematsu," said Jesse Sutton, Chief Executive Officer, Majesco. "Their experience creating high quality, best-selling games means that AWAY will be well-positioned for success when it hits retail this fall." In AWAY Shuffle Dungeon, an unknown force has stripped Webb Village of its residents, and now the sole heroic survivor, Sword, must rescue the stolen villagers from the ominous dungeons as he strives to expose and defeat the mysterious thief. Sword must first collect and use various objects including musical instruments to reveal the secret dungeons where prisoners are being held. But successfully saving them is another challenge altogether given a unique timed "shuffle" mechanic that reconfigures the dungeon prisons and hurts Sword and any survivors still caught within when the time runs out. Saved villagers will lend assistance to Sword's quest, as will the magical ‘Fupongs' and dungeon treasure he finds that lets him shop in the village specialty stores for armor, weapons, health, medical aid and more. AWAY Shuffle Dungeon allows players to navigate in both the 2D Shuffle Dungeons and the 3D Webb Village, and features voice-over cinematics that breathe life into the characters in this extraordinary mystery. AWAY Shuffle Dungeon for Nintendo DS™ is expected to release this fall. For additional information about Majesco's exciting line of products, please visit www.majescoentertainment.com. Majesco Entertainment Company is a provider of video games for the mass market. Building on 20 years of operating history, the company is focused on developing and publishing a wide range of casual and family oriented video games on leading console and portable systems. Product highlights include Nancy Drew™, Cooking Mama™ and Cake Mania® 2 for Nintendo DS™ and Cooking Mama: Cook Off for the Wii™ system. The company's shares are traded on the Nasdaq Stock Market under the symbol: COOL. Majesco is headquartered in Edison, NJ and has an international office in Bristol, UK. More information about Majesco can be found online at www.majescoentertainment.com.